The Norwegian Jade is all about family friendly cruising, offering activities for each member of the family as well as family activities. Imagine several days of cruising during which you get up each morning, and you and your family head to the dining room where all of you choose from a variety of breakfast foods prepared to order. After breakfast, you accompany your children to the complementary youth programs in the Splash Academy. 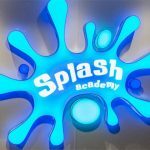 In Splash Academy’s, well equipped, modern, comfortable recreation areas children participate in age appropriate activities led by a professional staff, each of whom speaks a minimum of 3 languages, and has an educational background in child development and recreation services. Guppies –Ages 6 months to 3 years. Parents can bring their children to the Guppies Playroom, which is equipped with books and toys that parents can use to interact with their children for sensory play, music and movement, ball play and building with blocks. Turtles-Ages 3-5 years. Programs take place in the main Splash Academy recreation areas and include: Arts and crafts, painting, games, sensory play, storytelling, developmental activities, parades and treasure hunts. Seals–Ages 6-9 years. Programs are held in the Splash Academy recreation areas and include: Circus Skills and Show (Scarf Juggling, Plate Spinning, Devil Sticks, and Rope Spinning) theme nights, painting, sports and games, parades, treasure hunts, and video games. Dolphins-Ages 10-12 years. Programs are in Splash Academy recreation areas and include: Entourage Takeover, Circus skills and Show (Stilts, Ball Juggling, Chinese Yo-Yo, Plate Spinner and Devil Sticks) scavenger hunts, sports and team building, theme nights, and video games. Entourage-Ages 13-17 years. Teens socialize with other teens their age, in supervised teen centers around the ship playing video games, seeing movies, enjoying music, and sports. Children with special needs are integrated into daily programs at Splash Academy. Children can bring iPads and other learning aids as needed. When the ship is in port, complimentary programming in Splash Academy is available. A small fee of $6 per child covers the cost of supervision during meal times. If your children prefer to remain on board and not participate in one of the many shore excursions offered by Norwegian, they can remain in Splash Academy, and have lunch and dinner with other campers and staff. This service enables parents to take a several hour shore excursion knowing that their children are being well cared for and having an enjoyable day. While your children participate in activities and are making new friends at the Splash Academy, you and your husband can enjoy one of the many daily activities on board that make cruising such a unique occasion. When you return to your cabin, beds are made, the bathroom is clean, and the room is neat. 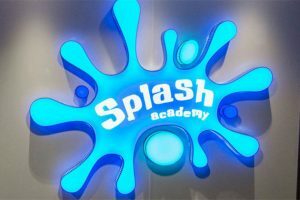 Each day that your children participate in Splash Academy they can join you for lunch and family activities from noon to 2 PM. You can choose to eat in the dining room with waiter service, or at the buffet in the Garden Cafe, or have hamburgers and hot dogs poolside. 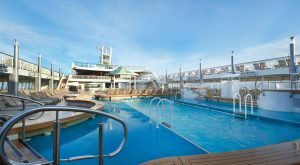 At 2 PM, when Splash Academy opens for the afternoon session, you can choose to pamper yourself in the spa, or you and your husband can attend one of the many activities being offered throughout the ship such as an art exhibit, lectures, dance classes, or poolside games. From 5-7 PM, the family can come together for dinner and make an evening of family activities including shuffleboard, volleyball, board games and table tennis, or the children can return to the Splash Academy and stay from 7 to 10:30 PM. Splash Academy evening activities include movies, group games, and video games. While they are enjoying being out with new friends, you and your husband can catch a show in the theater, listen to live music in any one of the several lounge areas, or enjoying a romantic dinner for 2 at one of the several specialty restaurants which include an Asian and a Brazilian restaurant, as well as a French Bistro, a Steak House, and an Italian Cucina. When you return to your cabin, at the end of the day, there will be chocolates on your pillow and a towel in the shape of zoo animal on the bed. You can put your laundry outside your cabin door and it will be picked up, washed and pressed and returned to your cabin within 2 days. Enjoying family friendly cruising starts with choosing a ship that offers a lifestyle while on board that is comfortable for parents and offers interesting, fun activities for each member of the family. 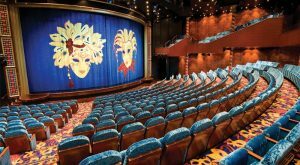 Cruising from Tampa, Florida to ports in Europe, on the Norwegian Jade, I got to see, first hand, what family friendly cruising is all about. As a parent, a former preschool teacher and camp director, I was anxious to see how the Jade staff made cruising an adventure for children and a much appreciated time out for parents. As someone who chooses cruising over land vacations 3 times a year, I can report cruising is a dream vacation. From the time you step on the ship till the time you disembark most activities of daily living are done for you. Cruising is a cost effective way to travel, less expensive than staying at a land resort. All meals, with the exception of specialty dining, are complimentary. Coffee, tea, and juices are available throughout the day and evening at no cost, as is soft serve ice cream by the cup or cone. There is a charge for soda and alcohol. Every dining room has high chairs and booster seats. Children can order from a child friendly menu and they are served first. After they eat, while parents enjoy their meals, the children are given coloring materials. They can also use any handheld devices, they might have at the dining table.The dining room wait staff can and will accommodate the needs of adults and children with special dietary needs, and those that have food allergies. Should any member of the family require medical attention while cruising, the medical department is open daily, and staff are available by phone in the off hours. Cribs are available for parents with infants. All cabins are equipped with refrigerators where parents can store infant bottles as well as other items that need refrigeration. When I spoke to some of the families cruising on the Jade, they had high praise for the Splash Academy. They appreciated the attention that wait staff paid their children at each meal. Those with young children found it easy to care for and keep them contented on board. Teens shared that the Entourage programs gave them the opportunity to do their own thing, independent of the family, with new friends. All agreed that the Jade provided them with a family friendly cruising experience that exceeded their expectations. 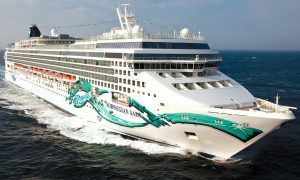 Sources: Elizabeth Lytle, Public Relations Coordinator, Norwegian Cruise Line; Norwegian Jade: Roberto De Pasquale, Cruise Director; Janette Augustin, Shore Excursion Director; Cholette Hayag, Group Service Director, Shunyu Huang Joel, Group Service Director; Sharon Viljoen, Splash Academy Manager, Iulia Vlad, Assistant Maitre D; Boris Kojic, Maitre D Hotel; Omar O’Besso, Concierge, and Swaroop Bannange, Asst. Maitre D at Alizar restaurant;Alfren Cruz, wait staff; Anil Chennadasar, wait staff.